That's how much cheaper this month's electric bill was, compared to last month's. Recently, John and I hung a retractable clothesline in our backyard, and we've been using it to dry most of our laundry. 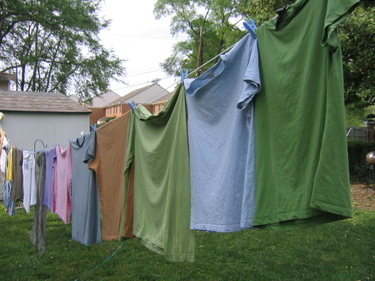 I'm convinced that using the clothesline is one of the major reasons for the decrease in our bill. I simply wanted to do a simple thing to be a little bit more environmentally conscious, but the extra cash is icing on the cake. Can someone tell me why we weren't doing this all along? And if you don't have one, go ahead and get yourself a clothesline already!